The Nimo PD uses new LED technologies to provide safe bright light anywhere you need it without connecting any wires. It uses 3 D cell alkaline batteries (not included) and will run for more than 1 year without changing batteries (based on average use). 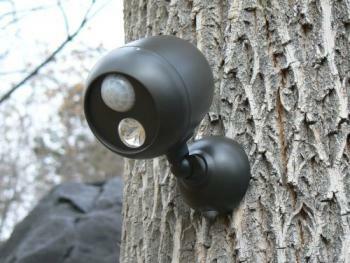 The Wireless LED flood light uses a sophisticated motion sensor coupled with a photo sensor. The flood light will only turn on when it is dark and only when motion is detected. The light automatically turns itself off. The LED flood light comes complete with a 4 way swivel mounting bracket. The Nimo PD is a perfect light to aid in the security and convenience of any camp, yard, outbuilding or residence. Why drain your battery by leaving your RV’s porch light on or walk into camp in the dark. Your Nimo PD will light your way! Mounts Anywhere – No Wiring Required! The NIMO PD Floodlight comes with the NIMO PD BRACKET. The NIMO PD Bracket creates a quick set up and take-down for the flood light. 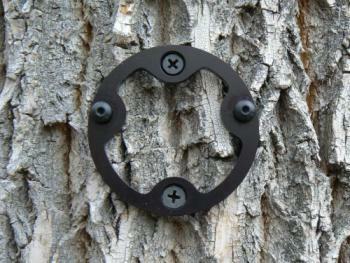 The bracket is anodized machined aluminum with two studs and two counter-sunk holes for grabber screws. Easily attaches to uneven surfaces! Permanently mount the bracket to the exterior of your RV. 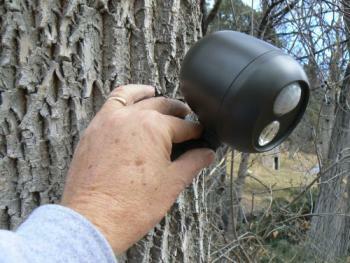 Use several flood lights to create a light sensor perimeter around your camp.